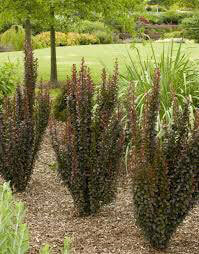 This is an upright column shrub which is broader at the top than at the base. Beautiful burgundy foliage spring and summer, which becomes a rich red in autumn. Dainty yellow flowers in spring followed by red berries.